Four titles are lifted on Day Four of the Seamaster 2018 ITTF World Tour Platinum Liebherr Austrian Open, as anticipation rises ahead of next month’s World Tour Grand Finals in Incheon. 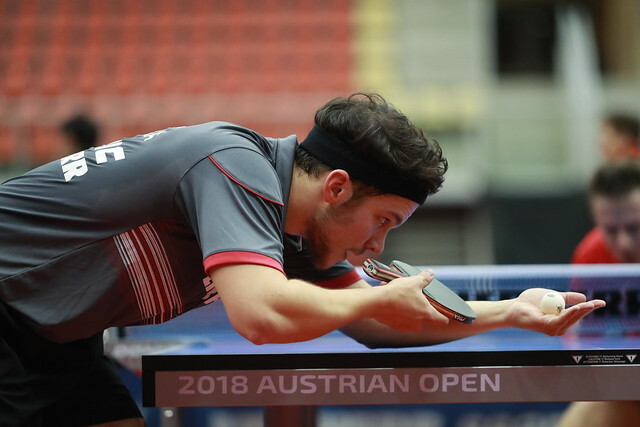 The narrative throughout the Men’s Singles competition at this year’s Austrian Open had been about lower ranked players shocking the top seeds, and there would be a fairytale ending too in Sunday’s final. Starting his journey in the preceding qualification event, world no. 80 LIANG Jingkun had seen off the globe’s highest-ranked player FAN Zhendong on Saturday to reach the final before defying the odds again the next day to see off world no. 2 XU Xin over seven games (11-5, 4-11, 11-6, 9-11, 13-11, 11-13, 11-2). Four games were all that CHEN Meng needed to see off defending Austrian Open champion WANG Manyu for the Women’s Singles title in a devastating final display (11-8, 11-9, 11-4, 11-7). The result yielded the Chinese world no. 6’s first Women’s Singles title of the year and ninth of her career, as she approaches the World Tour Grand finals in the best possible fashion. Preventing a third Chinese success of the day, Hina HAYATA and Mima ITO lived up to their billing as the no.1 seeds with an emphatic victory over 2017 Austrian Open champions CHEN Xingtong and SUN Yingsha (11-6, 11-7, 11-8) for their third Women’s Doubles gold on the 2018 ITTF World Tour. The Men’s Doubles title also ended in Japanese hands, as Masataka MORIZONO and Yuya OSHIMA beat Korea Republic’s JEOUNG Youngsik and LEE Sangsu (12-10, 11-9, 3-11, 11-4) to taste glory for the first time this year after losing out in three previous finals on the 2018 ITTF World Tour. It was a tournament to remember for England’s Liam PITCHFORD, who beat three-time former Austrian Open champion Timo BOLL (11-6, 11-6, 5-11, 8-11, 13-11, 12-10) to reach the semi-finals. PITCHFORD’s subsequent defeat to XU Xin saw him only just miss out on the World Tour Grand Finals, with BOLL ultimately crossing the line in 16th place. In another pulsating quarter-final, this time in the Women’s Singles, WANG Manyu overcame compatriot DING Ning over seven games (11-5, 9-11, 2-11, 11-8, 11-6, 6-11, 11-7). Meanwhile, MA Long withdrew from his second successive tournament on Thursday, having departed early from the previous week’s Swedish Open. The Chinese star is recovering from a knee injury ahead of the World Tour Grand Finals. Now that all 12 stops on this year’s ITTF World Tour calendar have been visited, all eyes turn to the Seamaster 2018 ITTF World Tour Grand Finals set to take place in Incheon, Korea Republic, between 13-16 December. Click here to see all the players who qualified for the showpiece event.